The addition of an electronic viewfinder makes the Olympus Pen E-P2 a marvellous camera for enthusiasts and professionals. It's small, has advanced controls and is capable of taking super-clear images. The Olympus Pen E-P2 is a Micro Four Thirds–based digital camera with a 12.3-megapixel CMOS sensor and a knack for capturing supremely detailed images. It's a wonderful piece of technology for photography enthusiasts who want a compact digital camera that will give in graciously to your will and allow you use the specific exposure settings that you require. You can think of the Olympus Pen E-P2 as a compact camera that's like a digital SLR. The Pen E-P2 doesn't have a mirror box, but the features and capabilities of the camera are very SLR-like. You can change lenses; you can change aperture, shutter, white balance, focus mode and ISO on the fly; and you can manually focus using the high resolution built-in screen. The specifications of the Olympus Pen E-P2 are largely the same as the Olympus Pen E-P1, but there are a few key differences. The major difference is that the Pen E-P2 can use the Olympus VF-2 electronic viewfinder (EVF). On the Pen E-P1, the viewfinder was optical and sat in the hot-shoe and was higher than the lens, giving a parallel field of view and no on-screen details. The VF-2, while it still sits in the hot-shoe, actually plugs in to the camera and gives you a 100 per cent field of view, plus all the on-screen information you need to adjust your settings as you look through it. It's more than just a useful tool for bright days when you can't comfortably see the LCD screen; it's a very high resolution EVF that allows you accurately focus and frame your shots. In fact, we actually prefer using it when taking macros and manual-focus shots because by holding the camera to your face, it is kept steadier and you can see everything clearer. The one thing that you can't rely on the VF-2 for is accurate colours. The main LCD screen and the VF-2 EVF have a discrepancy in their colour temperature: the same scene will have a different mood depending on which one of them you are looking at. You can check your photos on the main screen before and after you've taken them to make sure the colours were captured as you'd intended. We like the way the VF-2 is hinged so that you can take shots at a downward angle — it's very similar to the EVF of the Ricoh GXR. The only thing that would make it better (apart from more accurate colour balance) is having a slightly larger rubber frame around its eye piece, which would block out light from the sides. The body of the Olympus Pen E-P2 is the same size as the Pen E-P1, but it's a gun-metal grey colour instead of silver and it has a port below the hot-shoe that is used for the EVF and for an external microphone. The body feels very well constructed and all the buttons are well laid out and easy to use. The mode dial, which sits on the left side of the camera, is a little harder to manipulate, but this is also a good thing — it won't accidentally get knocked out of place. Like the Pen E-P1, the Pen E-P2 lacks a built-in flash, which makes it a little limited for parties and other indoor events (unless you buy the optional flash). However, it does have built-in optical image stabilisation (image shift type), which allows you to take clear hand-held shots even down to 1/5sec; it also works well at high ISO speeds. 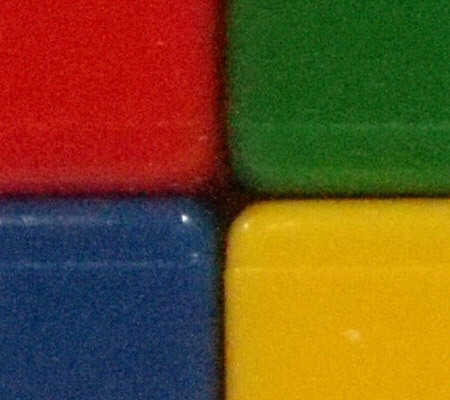 You can see from the following close-ups that noise is not a problem for the Olympus Pen E-P2 — even up to ISO 800 — but that some grain starts creeping in after that, as well as some tonal change. If you don't view the images at their full size, then the noise won't be very noticeable at all using high ISO speeds. 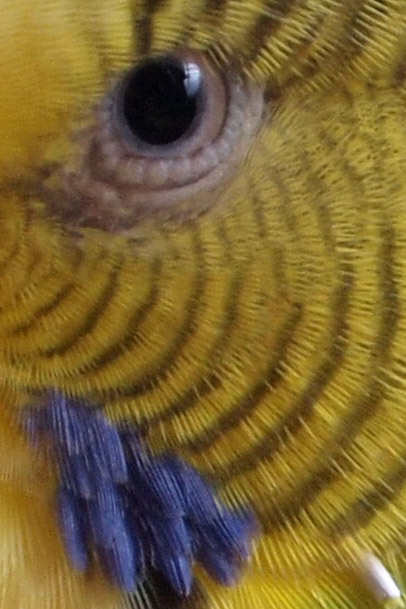 If you plan on cropping the 12.1-megapixel image very close to accentuate a detail (such as the budgie's eye, below), then you should use ISO 100. The level of detail that you can bring out of large images is phenomenal and it's one of the key strengths of the Pen E-P2. You can use it for macro photography and get nice and close to your image, and then crop that image to get even closer! A close crop of a budgie's eye. For our tests, we used the Olympus 14-42mm f3.5-5.6 Standard Wide Zoom (M.Zuiko) lens, which you have to unlock before you can use the camera. Because of the 2x crop factor of the CMOS sensor, the equivalent focal length of the lens in 35mm format is 28-84mm. It's a useful lens for close-ups and has great depth of field so that you can almost completely focus beyond very close objects. The focusing performance of the Pen E-P2 is very good for the most part, but it does sometimes struggle in the dark because it doesn't have a focus assist lamp. It improves on the Pen E-P1 by including a focus tracking mode, which worked well in our tests to keep a moving (albeit slowly moving) object in focus. Manual focusing is a little difficult as the camera will zoom right in to the centre of the image so that you can get a good look at your subject and see if it's completely in focus. Camera shake can make the focus operation a headache inducing one, and it can also be a pain to pick the right spot to focus on. Nevertheless, once you figure out the best way to do it, manually focusing the Pen E-P2 can be very rewarding. Another of the big talking points of the Pen E-P2 is its Art mode, which gives you numerous filters to play with, including a black and white grain mode, pin hole, and Diorama mode, to name a few. Diorama mode is a favourite of ours as it can give the effects of a tilt-shift lens and make your subject look smaller. You can have a look at the results from some of the filters, as well as the overall image quality of the Pen E-P2, in our slide show. If you aren't very comfortable using all the manual features of the Pen E-P2, then you can just leave the mode dial parked in iAUTO mode and let the camera do the work for you. More often than not, it will do an outstanding job, especially in daylight; its results might not be to your liking at night though. The camera's shot-to-shot performance in auto, manual and semi-manual modes is very fast, and it can take up to 15 shots in burst mode, at a rate of approximately 2.5 frames per second, before slowing down. Some of the filters will slow the camera's performance; for example, when using the pin hole and Diorama modes, the screen (or EVF) will refresh very slowly while you try to frame your subject, and then there will be some lag as the camera processes the photo after you take it. Of course, they are Art modes, and you can't rush art — so use these modes when you want to capture a static scene rather than a dynamic one. With the excellent auto mode, very useful electronic viewfinder, a plethora of Art and scene modes, as well as extensive manual control, the Olympus Pen E-P2 is a joy to use. But the thing that stands out most is its ability to take super-crisp photos that you can print at very large sizes without losing any quality. You won't be disappointed with its results.